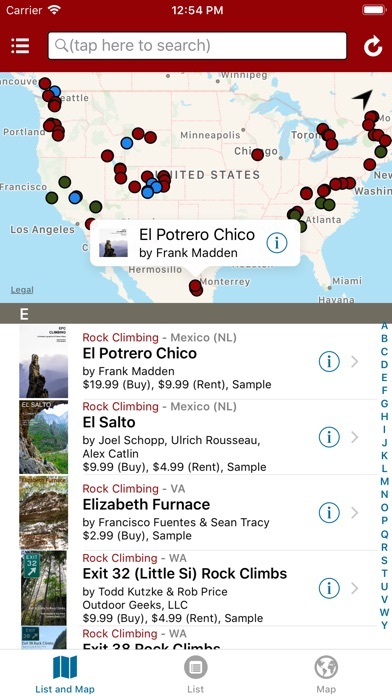 rakkup allows you to access an entire bookshelf of climbing and backcountry skiing guidebooks on your iPhone, even beyond the reach of cell phone coverage. Once downloaded, guidebooks work offline with no Internet connection! It is also the first and only mobile climbing app that navigates you through the trail system to your climb, turn by turn. Produced in partnership with Outdoor Research, rakkup reinvents the guidebook for the smartphone era. We've partnered with Wolverine Publishing and other publishers to bring you rich guidebooks complete with color photos and topo drawings. Free sample climbs and ski descents are included. 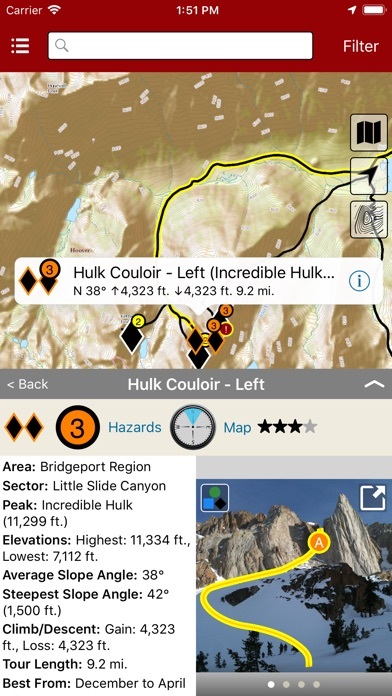 Browse climbs and descents on a map or in the list format of your choice, filter and search in seconds, then navigate using your phone's GPS with a single tap. 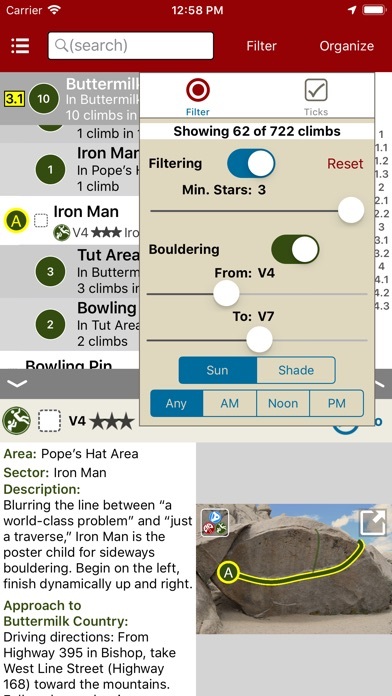 In climbing guidebooks, the app continuously calculates the easiest route through the trail system from your current location. Simply follow the arrow and moving map. Note: When actively navigating to a climb, rakkup uses GPS in background. Continued use of GPS running in the background can dramatically decrease battery life. The next step in guidebooks. GPS navigation, detailed topo maps and descriptions, plus a tracking mechanism to see how you're progressing on your route. The snow sports side of this app is certainly fun to play with and drool over sweet lines. But where it really shines is with the tools for helping the decision making process in avalanche terrain. The filter function, hazard explanations, and intuitive navigation are good examples. What sets Rakkup apart as an app is its reliance on professional authors including mountain guides, ski guides and renowned athletes. In the high consequence world of avalanche terrain travel, reliable information is paramount. It’s nice to see an app developer take this seriously. The best thing about the iPhone version is navigation. So helpful for first time trying to find the crag. Great app for tracking outside routes . The guides can be amazing or OK depending on how much work put in by the author . GPS function is amazing but needs a tad bit of work . Love it! App is really easy to use, functional, intuitive. Makes route finding easy, makes it easy to figure out how to get to the crag. Love it. 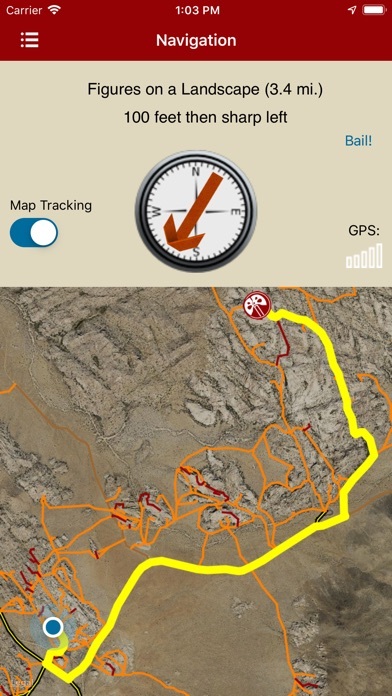 The maps, interactivity between routes/photos, and the climbing log all integrated into one app are awesome. Make beta notes for yourself after a burn to review for the red-point attempt. Swipe between lines to make sure you know what your about to get on. It's intuitive, and at least for the Portland area really helpful. Awesome app. 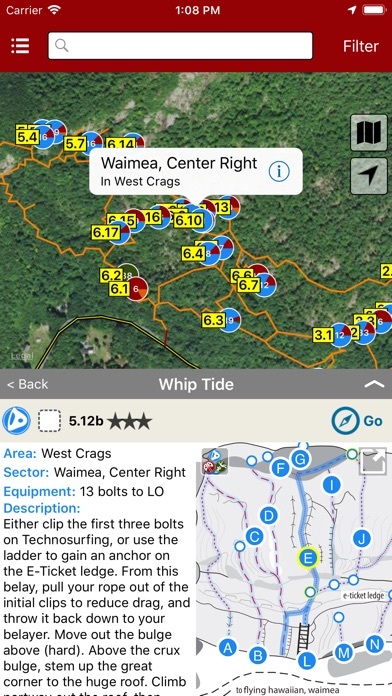 Makes finding routes extremely easy and gives simple descriptions of approaches. Pictures of the walls with graphed lines for each climb is very organized and boosts the climbing experience so much. My only problem is a few bug fixes. The main one is a glitch that happens after I blow up the route pictures to full screen and then try and shrink it down to read the description, about half the time it flashes to a tan screen and I have to restart the app to get it functioning. It is extremely annoying. Please get this fixed. Also the GPS system is a little touch and go. Great when it works but only works about 20 percent of the time. Looking forward to new books!! The app was great and had awesome features until it started crashing upon login. I now cannot access my guidebooks.